I could go on with vignettes. I have lots of them. 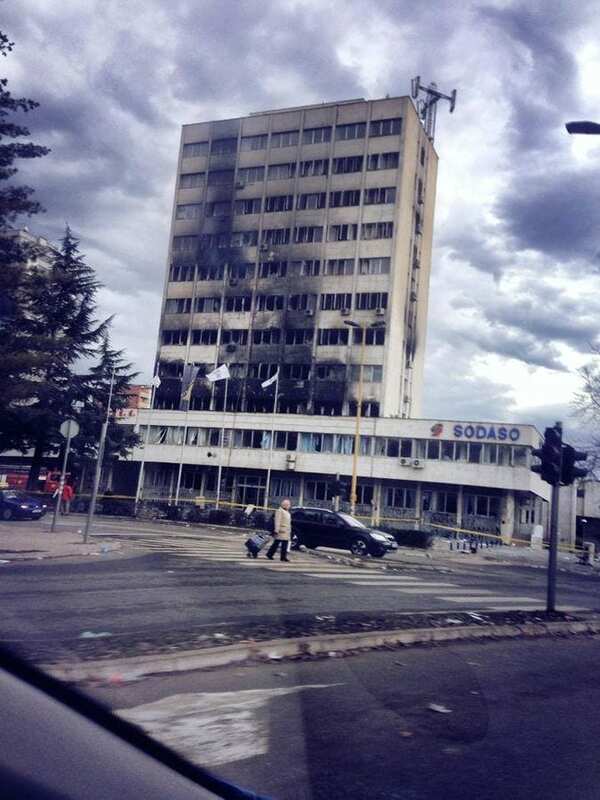 But these sorts of scenes might be thought of as the background of the protests that began last week in Tuzla, developed into police violence by Thursday afternoon, and spread across Bosnia’s larger entity, the Federation of Bosnia-Herzegovina partly in the form of mob vandalism by Friday. By Saturday morning it looked a bit of a part-triumph (some useless politicians resigned, and some police officers withdrew their loyalty) – and a bit of a horrid mess (among the things burned in the protests were valuable documents, both ones related to the dubious activity of the targets of the protests and possibly a hugely valuable portion of Bosnia-Herzegovina’s archives). So what brought this about, and what does it suggest for the near future? Over the two decades since Dayton, the immovable political class that the agreement established has taken every opportunity to demonstrate its irresponsibility and utter uselessness. Last year’s JMBG protests were catalysed because of the inability of parties in the parliament to reach an agreement that would allow state agencies to issue identity documents to newborns, resulting in the death of a young child who was prevented from crossing the border to get urgent medical attention. The response of high- (and long-) ranking government officials was to accuse citizens of endangering their security. These feats of concern are carried out by politicians who are the highest paid in the region. In addition to the generous salaries they award themselves, officeholders are able to further supplement their earnings by claiming pay for membership in boards, commissions, consultative bodies and so on. And this in an environment in which unemployment among young people exceeds 60%. The Daytonian political class has established an enduring model of officials who believe that citizens exist to serve them, and act on that belief. One of the mantras of the political class, encouraged by its international overseers, has been privatisation. In the broad context of an environment where most of the companies where most people used to work took the form of “social property,” that meant taking goods that had been built through public investment and transferring them into private hands. And since private owners do not have the obligations that social owners have, this means a lot of publicly subsidised asset-stripping, budget-skimming and credit-bouncing. Many of the institutions that used to employ people have not done so for years. To take a specific example, let’s look at Tuzla, where the protests began. The local chemical factory SODASO used to produce 80% of the table salt consumed in Yugoslavia, 208,000 tonnes of it in 1991. By 1999 it was producing 21,000 tonnes. Privatised in 2002, by 2013 the company employed only 422 people, down from 2500 in 1998. That local government building that was at first defended by police with batons and tear gas, then overrun by citizens and then set ablaze? That’s the former SODASO headquarters, being used by the local government as the company languishes in receivership. It is probably not too difficult to imagine the anger attracted by a building that has come to symbolise how a once big functioning industry provided a livelihood for people, and now a bigger functionless bureaucracy lives off them. Bosnia and Herzegovina’s Dayton-made institutions were designed not to represent citizens and designed not to function. There was some sort of early Fukuyamesque idea that eventually they might develop into a responsive democratic state, but in the meantime the “international community” provided some institutions to oversee them. There is a High Representative who can (but generally does not) nullify government decisions and replace officials. There is a Constitutional Court whose membership is made up of one-third foreigners which can reverse decisions by other courts and the parliament. And of course there is the whole set of conditions related to conditionality, through which the European Union is supposed to be able to offer a range of incentives and sanctions based on the promise of eventual membership of the EU. There have been some periods in which the international overseers of Bosnia’s government took an active role. But not lately: the tendency has been for institutions like Office of the High Representative (OHR) to think of the dominant politicians as potential clients who can be turned into protégés and eventually gain the capacity to carry processes forward. So the internationals were silent about the JMBG protests, have been silent about these ones (though they regretted that angry crowds used a little force – what did we pay for all that police equipment for? ), and will be silent about the next ones – and about any effort on the part of citizens to be treated as citizens. When the OHR and related institutions were seen as overly active, this was a problem since there was a sense that they were impeding the development of institutions. At the other extreme they are also satisfying nobody, as they have become the guarantors of the unimpeded power of the useless elite. As long as they wait for that tapeworm to transform itself into a cuddly little puppy, they aren’t helping. This is not, at least in its gentler daytime incarnations, one of those protest movements that shouts a lot and has no orientation. Well, the part of it that has been setting stuff on fire may be, but there are meaningful parts of it that have been engaged in a different kind of articulation. The six demands from the Tuzla workers, include investigation of illegitimately obtained public property, elimination of special privileges for the political class, and formation of a new government that excludes participants in the existing one (which has since resigned). The eleven original demands of the Tuzla protesters, published by the group “Jer mi se tiče,” include social welfare and the right to work. There are a few other documents with lists of demands out there, and there will a be few more over the next few days, but they have some themes in common. They want an end to the self-serving of the political class, they want to be able to work, and they want social rights improved across the board. None of them are basing any claims on nationality, religion, or any of the other divisions that characterise BH in the stubborn international stereotype of it. They say that it is very difficult to make predictions, especially about the future. But here are a few. What does the near future have in store for people who participated in and had sympathy for the protests? First of all, they will be called hooligans and media will repeatedly point to objects, especially ones of cultural value, that have been destroyed. Second, regardless of the roots of the protests in social rather than national conflict, the fact that local power-swingers in BH’s smaller entity were not targeted will be used for intensified nationalist prepucavanje. This will be rhetorically successful unless people start protesting in RS as well. Third, this is an opportunity for political actors in the country and in the region more generally to begin to ask themselves about the balance between how luxuriously they serve themselves and how shabbily they treat citizens. Although a few more people are likely to resign, if past history is a guide then the opportunity will for the most part not be taken. Fourth, this is an opportunity for the internationals who have oversight of the activity of political institutions and the people in them to ask whether they have chosen the right clients, and also to ask whether the internationals themselves are contributing to deepening problems rather than solving them. This is an opportunity they have repeatedly demonstrated that they are not capable of taking. Fifth, for the second time in a year (the last time was during the summer’s JMBG protests, when the government revelled in its incapacity to issue basic documents), citizens of Bosnia-Herzegovina have shown that they are willing and able to act as citizens rather than illustrations of some freaks’ national fantasy. They are going to get better at it and it is going to spread, because the problems that infuriate them are present everywhere, and are being addressed nowhere. This is probably not the workers’ revolution we have been promised since those nice manuscripts began to be criticised by rodents in 1844. Sorry. And it is also not any kind of Spring. It is February. Above all it is not a savage attack by hooligans on legitimate institutions and order. The existing institutions have not bothered to try justifying themselves for some time now. And yes, while burning things is on the nasty and stupid side, there has probably an excess of crocodile tears shed about the fact that angry people are likely to act like angry people. The way this is prevented is by meeting people’s needs, not by stocking up on tear gas. But it may be a sign that patience with predatory government and enforced decline is coming to an end. Impatience itself, though, does not tell us very much about the future. The future depends on what happens, but a promising sign is that now this may depend on what a larger rather than a tiny group of people may do. Eric Gordy is Senior Lecturer in Southeastern European Studies at UCL-SSEES. This piece first appeared on his personal academic blog East Ethnia and is reproduced with permission.